All Flex positions to provide users with thermal system solutions in addition to heaters. Company also offers low profile sensing devices. All Flex, one of the country’s leading manufacturers of flexible printed circuit boards and flexible polyimide and silicone rubber heaters, has introduced an easy-to-use thermal controller for engineers, product developers, and designers who seek simple use and a plug-and-play option for their thermal package. The company also announced that is has begun offering two models of stick-on polyimide-based sensors consisting of a RTD and a 10K thermistor. These new offerings, coupled with its recently expanded capabilities of thermal analysis modeling using Finite Element Analysis (FEA), shows the industry that the company is positioning for a broad market presence in thermal package solutions. The company also offers permanent heat-sink mounting for customers desiring to source a preconfigured, drop-in thermal component. 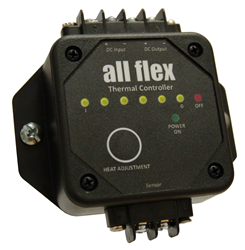 All Flex’s new controller, the AFTC-5000 utilizes a single-button interface providing both OEMs and end-users with the ability to easily adjust the thermal settings. The controller provides 6 temperature setting increments that are pre-programmed by All Flex per the customer’s specific requirements. In addition, the controller operates using the input power to the heater and eliminates the need for its own power supply. The controller and sensors details are available on the company’s web site. In addition to traditional purchase options, both can be obtained through the company’s on-line custom order “Build-A-Heater” system or through the company’s shopping cart.